In February 2018, a group of international exchange alumni from countries in the Caribbean were selected to participate the “Alumni in the Action for Resilient Communities: Disaster Preparedness and Emergency Response” seminar. This seminar took place in Port of Spain, Trinidad and Tobago. After the seminar, alumni participants developed projects that would raise awareness in their communities about disaster preparedness and risk management. 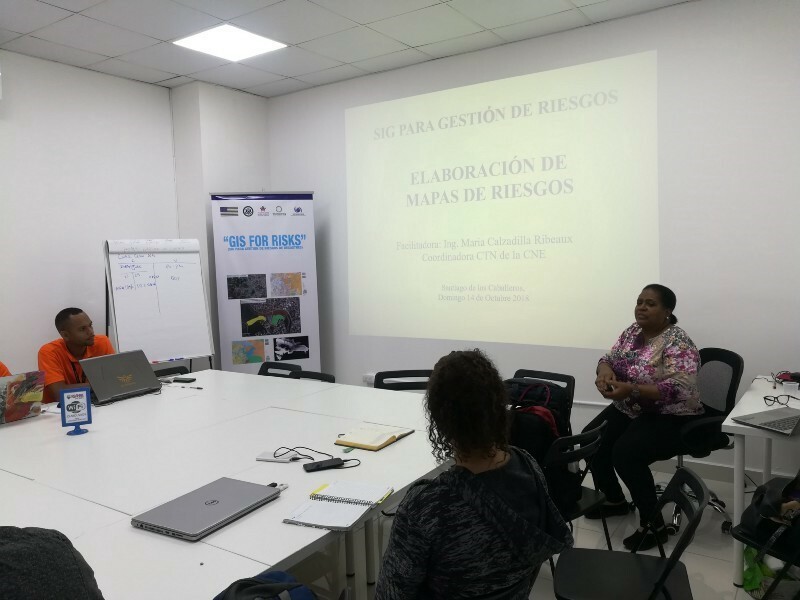 A group of four alumni participants from the Dominican Republic and Haiti created the project “GIS for Risks,” a training course for disaster management professionals in Santiago de los Caballeros, Dominican Republic. 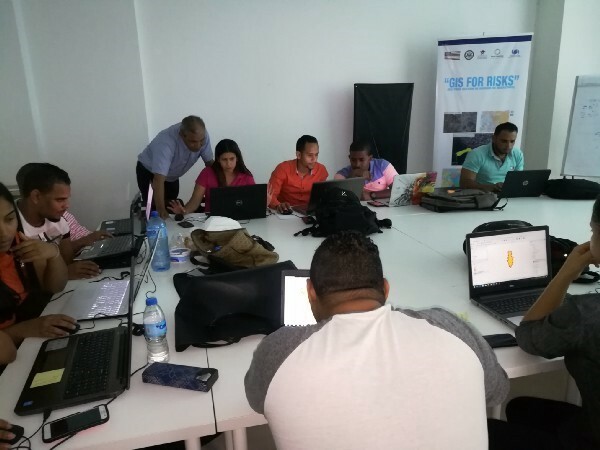 “GIS for Risks” aims to train and prepare 10 to 15 disaster management professionals in the use of geographic information systems and remote sensing in the city of Santiago de los Caballeros, Dominican Republic. This initiative will improve the capacity for rapid response to emergencies and natural disasters, therefore, ensuring more resilient communities. Due to its geographical location and geotectonic characteristics, the city of Santiago de los Caballeros, in the Dominican Republic is exposed to a variety of natural hazards including hydrometeorological and geophysical events. Tropical storms and floods are the leading natural causes of disruption and destruction throughout the communities within Santiago. Rapid population growth and urbanization combined with extreme climate events are also causing a rapid increase in vulnerability of communities exposed to these hazardous events. As a result, disasters are taking a substantially heavier toll on life and property in Santiago. Land degradation, unplanned growth in urban and rural areas, and weak enforcement of buildings codes and land use regulations are just a few of the main drivers of the current vulnerability in the zone. Over the years, stakeholders in varying sectors and disciplines have been working in prevention, preparedness, and rehabilitation programs to counteract the effects of natural disasters. This project will develop activities that guarantee the sustainability of preparedness and response projects at all levels using geographic information systems. 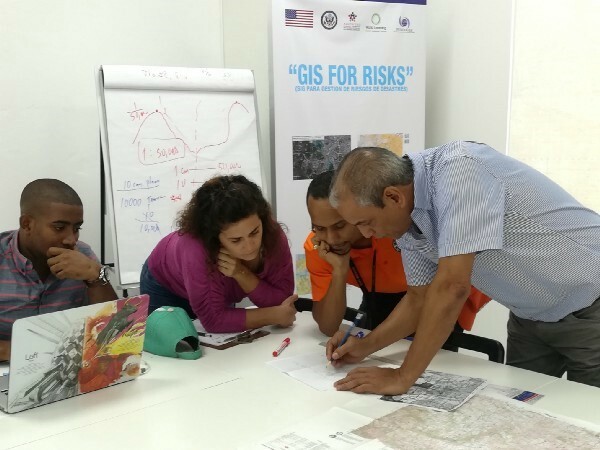 Brainstorming effective mechanisms for disaster risk reduction goes hand in hand with GIS as geographic information systems play an important role in disaster risk assessment and management. Therefore, the significance of creating a training course that emphasizes GIS usage is vital in order for it to be implemented in other cities and countries. The course not only reveals what spatial data is and how it is collected but also emphasizes the use of such spatial data during pre- and post-disaster management. Pablo Ovalles, one of the instructors, teaching how to scale a map. The training course consisted of four training modules during the fall of 2018, which covered Disaster Management Concepts, Introduction to GIS, Remote Sensing, Basic Cartography, Quantum GIS Installation, Mobile Data Collection, Spatial Analysis, and Spatial Interpolation. The training program will continue into 2019 with a practicum. Dr. Maria Calzadilla teaching the Disaster Risk Management Concepts module. Define and describe basic concepts and terminology related to geospatial information technology. Apply basic methods and functionalities of GIS software to produce relevant geographic information. Produce basic maps using GIS software. Develop effective processes for preparedness planning in order to improve disaster response and recovery programs. Effectively and efficiently, set up and utilize an emergency coordination center to manage disaster events. The students gained valuable knowledge on disaster preparedness using geographical information system tools during the first phase of the training program. The second half of the program will be a practicum on how to use a Global Positioning System (GPS) in conjunction with Quantum GIS (QGIS). Pablo Ovalles teaching the students how to use QGIS. Delka Espinal is an emerging leader in the field of disaster risk management. Since April 2012, she has been collaborating with the non-profit organization Dominican Foundation for Risk Management. Ms. Espinal serves as a program assistant for 100 Resilient Cities initiative, a Rockefeller Foundation-funded initiative dedicated to helping cities around the world become more resilient to challenges that are a growing part of the 21st century. She has a master’s degree in structures and a bachelor’s degree in civil engineering and specializes in GIS (geographic information systems) applied to disaster management. Ashley Morales is a geotechnical engineer and risk management analyst at the National Bureau of Seismic Evaluation of Infrastructure and Building Vulnerability in the Dominican Republic, where she oversees determining the soil’s condition for evaluation and seismic retrofit of structures. She also coordinates projects for the Risk Management and Planning Department. Moreover, she serves as Senior II Geotechnical Engineer at Epsa Labco, an engineering consulting firm in charge of the analysis and design of foundation solutions. In addition to these roles, Ashley works as a GIS consultant for public projects. José Almodóvar is natural resources technician at CEDAF, a private non-profit organization that promotes the sustainable development of the agricultural and forestry sector in order to reduce the levels of poverty and protect the environment. Prior to CEDAF, José was a Farmer-to Farmer Field Officer, a program managed by Partners of the Americas and funded by USAID. José coordinated and reported Farmer-to-Farmer volunteer visits to address climate smart agricultural practices, strategic planning, capacity building, greenhouse production, and forest, watershed, and protected areas management. José received a bachelor’s degree in ecology and environmental management from ISA University in 2015.